Just last week, Instagram announced it’s new IGTV as they celebrated surpassing 1 Billion active users. By now, you’re probably used to hearing about new features and functions as the arms-race continues between the major players in the app space. But this one is different. The release of IGTV is aiming to have a huge impact on the way online video is produced and consumed. But does this mean that every brand should implement IGTV in their content marketing strategy moving forward? IGTV is a new feature that is accessible both within the Instagram app as well as in its own stand-alone app. It is meant to work much more like traditional TV. As soon as you open the app, you’re immediately greeted by full-screen vertical video from a “channel” without having to search for content. From the main screen, it’s easy to quickly browse between channels by swiping up and navigating through the various suggestions and followed channels. Unlike the traditional Instagram videos (which have been limited to 60 seconds), IGTV videos can run anywhere from 15 seconds to 1 hour. This means that anyone can upload their own “episodes” at length and keep the user on the app without having to direct them elsewhere. What does this mean for your brand’s marketing and advertising strategy? As audiences continue to shift from desktop to mobile, we are experiencing an increasing demand for videos to be produced in a vertical format. This makes it much easier for the viewer to consume content as vertical videos fit the natural configuration of mobile screens without having to turn the device. While vertical video seems to be here to stay, horizontal video is not going away either. There is a reason that movies and videos have been produced in a horizontal format for ages. This is because it feels most pleasing and natural to how our eyes see things. Bottom line: Consider the various platforms that your content will live on and plan accordingly. Don’t leave the video format to be an afterthought. Often times it can be smart to plan on creating your videos with both horizontal and vertical usage in mind. Instagram started out as a photo sharing platform and as such, certain types of content worked best on the platform. Historically, this meant eye-catching photos of food recipes, motivational quotes, and other visually engaging content. But now, Instagram has declared itself a major player in the video world with IGTV. With the ability to upload long-form video content that lives in the path of least resistance on mobile devices, the variety of content on IGTV will be much greater. This means that Instagram and IGTV should be a much bigger piece of your content strategy discussions. As always, you want to consider who your audience is and which platforms they live on, but we are likely to see a much more diverse audience on Instagram moving forward. Ultimately, content marketing comes down to relationships. From that first introduction to becoming close friends, content is crucial every step of the way. It’s how you build your social equity with your potential and current customers. The key is creating quality valuable content and releasing it on a consistent schedule. Taking advantage of the IGTV platform does not mean posting a video about your brand on occasion. It’s about committing to sharing content on a regular basis that actually provides value to viewers. So if you strike the right cadence, your audience will begin to expect and look forward to your content. As a prediction, we will see that online “web show” style formats that tell a story over the course of time will work extremely well. Think Vlogs, docu-series, etc. Think about how you can create a narrative around your content that involves the two fundamental components of any good story: characters and conflict. Conflict doesn’t always mean negative. Put simply, it comes down to “what question are we posing in the viewer’s mind that will be answered at the end by some resolution”. Should you include IGTV in your content strategy? 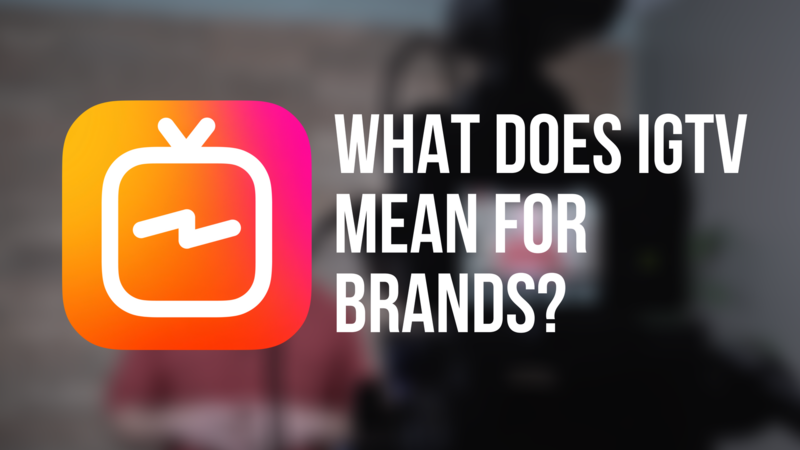 If you determine that your current or target audience chooses to consume content on IGTV, it may be worth testing. But like any true test on social media, it will require a reasonable amount of time and effort to draw a clear conclusion. Whether you decide to include IGTV in your content strategy moving forward or not, it’s always smart to keep an eye on the new platforms so you can pay attention to how online behavior is evolving. Consider the points mentioned above as you are building your content marketing strategy.